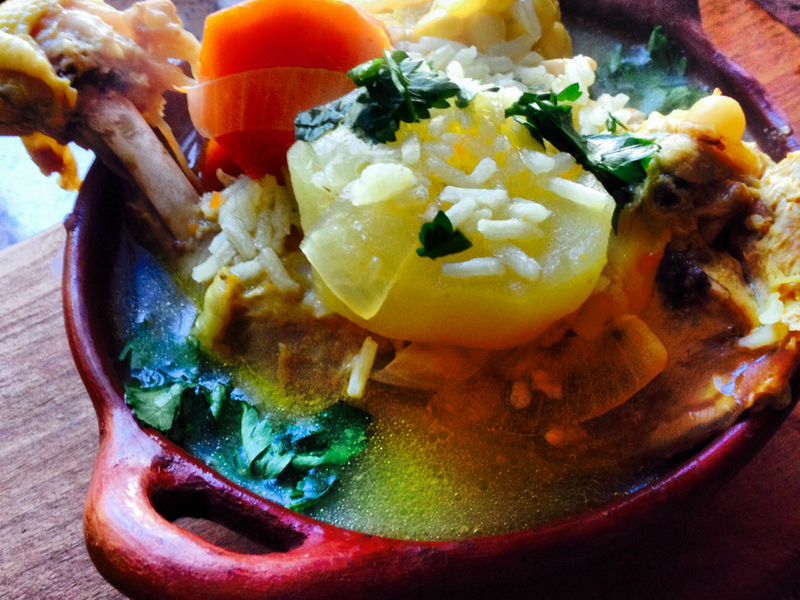 Cazuela de Ave may seem like any other stew, but it is not. The chicken is succulent and falls off the bone as you serve it. The vegetables are soft and sweet, melting in your mouth. All of the ingredients and spices mix perfectly on your palate and warm your heart. This stew is delicious, easy to make and very inexpensive. If you bought a chicken with the skin on, first you must take a knife, skin it and trim off any excess of fat. This will save you from needing to remove the fat from your chicken stock later on. Add the skinned chicken pieces and 3 litres of water to a large stock pot. Turn the burner on low to medium heat and cover the chicken and water with a lid. Cook the chicken for about 30-40 minutes, keeping an eye on it to make sure it doesn’t come to a hard boil. If it starts to boil, move the lid slightly to the side of the pot. Keep the lid on, entirely or partially, during the entire process. While the chicken is cooking, peel and chop the carrots, onion, garlic, coriander, squash and potatoes. Once the chicken is close to being done, around 30 minutes, you should have a nice chicken stock in the pot. Add all chopped carrots, chopped onion, minced garlic cloves, a small pinch of chopped coriander, salt, pepper and a pinch of paprika (if you desire) into the pot with the chicken and stock. Crumble your cube of chicken bouillon into the pot. There is no need to stir anything at any time. Just make sure that all of your ingredients are completely submerged into the chicken stock. After about 8 minutes, the carrots should start to soften. This can be tested by piercing one with a knife or fork. If it enters the carrot easily, it is ready. Now add the chopped squash and potatoes. Again, make sure that they are submerged into the stock but don’t stir. Now is also a good time to do a little taste test of the chicken stock to check if more salt or pepper is needed. After 8-10 minutes, test the squash and potatoes with a knife or fork. If they are starting to get soft, it is time to add the rice and pieces of corncob. The rice and corn should take approximately 10 to 15 minutes. The rice should be soft. To serve, put one chicken quarter into each bowl. Add to that some vegetables and rice, then ladle some of that delicious broth overtop it all. Garnish with a pinch of coriander. For a traditional food experience, serve them up in clay pots like the Chileans do! A few years ago, when Christina moved to Chile, she lived with a Chilean family that she now considers part of her own. One of her favourite memories was the amazing aromas coming into her room from the kitchen as the mother in the house cooked lunch: fresh vegetables, simple spices, grilled meats and homemade bread.